On Chinua Achebe’s Book on the Nigerian Civil War and the Aftermath! It is quite difficult for one to stand at any time without having to turn his back on someone or something. This is the exact situation for anyone who attempts to write a book on a controversial subject like the Nigeria-Biafra War (1967-70). In a period of renewed agitation for the sovereign state of Biafra in Nigeria’s South Eastern Region, writing on this topic can lead to serious emotive reactions. This is the case with Chinua Achebe’s There Was a Country. The book beautifully captures the story of a people who are enterprising, industrious, passionate, ambitious, determined, resilient, gallantry in battle, struggling for survival and their desire for freedom in the face of a repressive, neo-feudal and domineering state founded upon injustice and contradictions which are too obvious to ignore! While it is true that several books have been written on the subject of the Biafran War, few have come under intense reviews like this one. The reasons for this are not hard to find! Firstly, the author is a well-known literary giant who has written several literary classics including Things Fall Apart; so, many critics were probably expecting a more creative or “artistic” dimension as the standard set by the author for himself. The fact that his tone sounded more like a politician rather than the literary giant we know added to this seeming disappointment. Many probably recall that Achebe served as Biafran Ambassador during the war. Does anyone wonder why the book is subtitled, A Personal History of Biafra? Secondly, the timing of the publication appears faulty, coming at a time when Nigeria was facing its biggest security challenge which is the insurgency in the North East. This did not go down well with many Nigerians because of the heated debates that greeted the arrival of the book perfectly explains the situation! The book is divided into four parts, each contributing uniquely to its central theme. Part 1 deals with the author’s formative years; the historicity of the Nigerian state and the causes (immediate and remote) of the war including some frantic efforts on both parts to forestall the needless disaster like the famous Aburi Accord! Part 2 deals with the bloodshed, the rising casualties on both sides and the roles of international actors. This part also details the conspiracies, betrayals, intricacies and the complexities of national and international politics all conspiring resulting in extended casualties during the war. This part also explains the gallantry and the industry of the Biafran army in effectively (and sometimes poor strategy) resisting the “almighty” Nigerian army throughout the war. The roles of principal actors-General Yakubu Gowon (Nigeria) and Dim Odimegwu Ojukwu (Biafra); the defunct Organisation of African Unity (OAU) and the “World Powers” are beautifully painted here. Part 3 captures the later part of the conflict, say from late 1969 till the war ended. This part also describes the reasons for fall of Biafra (including heavy losses of territories and personnel) and the consequences of the war on both sides. The arguments of genocide, starvation and heavy casualties on both sides during the war are explained here. In Part 4, the author analyses the contemporary Nigerian social-economic and political challenges. Issues like terrorism, indiscipline, corruption and more importantly, Leadership. Achebe uses his well-known brand of story-telling to beautifully describe these in vivid details. While it is easy for one to be carried away by the author’s artistic genius or beautiful story-telling technique adopted in passing his critical message, this present reviewer thinks he is rather too emotional or wrote himself into the book on many occasions. While it is quite easy to destroy, it is never easy to create. It is on this note that the reviewer of this book will take a critical look at the “hotspots” raised in the book. First, the author practically blamed Biafra’s fall on every other thing but Biafra. It appears he finds convenient excuses for why a country “Was” rather than “Is”. The author cites genocide as a convenient excuse for why the “victor side” won, as though the war was a one-sided affair. He asks: “Did the federal government of Nigeria engage in the genocide of its Igbo citizens through punitive policies, the most notorious being ‘starvation as a legitimate weapon of war’?” (Achebe, 2012: 228). War itself is unfair. So, it will be uncharitable for anyone to claim the “victim” in a war which both parties took active parts. Was Achebe seriously expecting a “federal government” that will just to fold its arms and watch helplessly while the secessionist Eastern Region breaks away from the federation? How come the author finds it convenient to tell the bitter truth that poor leadership or strategy failure was the most important factor responsible for Biafra’s fall, and not the so-called genocide? The mishandling of Abagana ambush, the Kwale hostage taking, the Mid-West attack led by Victor Banjo and the breakdown in communication between Dr. Nnamdi Azikiwe and the Biafran leadership to mention but a few, could be responsible for the defeat. The author must have missed out on these before reaching his conclusion about genocide! One will wonder why the Biafran political leadership played ignorance of the Nigerian military “might” before engaging it in a war. Was the Vietnamese army of any “might” when it came up against the “almighty” US military resulting in the latter’s resounding defeat in 1968? If the poorly-trained, bare-footed Vietcong or Vietnamese soldiers could hold their grounds against the US; how does Achebe want us to buy into the “David-Versus-Goliath” argument he puts forward in support of Biafra’s fall? Many ethnic bigots deny that Awolowo, then minister of finance, ever made this statement, but the politician confirmed actually making the statement during the war to M.C.K. Ajuluchuckwu. He, however, said that the unfortunate statement referred only to Biafran soldiers, not civilians or children. It is our considered view that the author needs to purge himself of Awophobia. The reasons for this are simple. Achebe’s estimation of the politician is faulty, in that, Awolowo is not known to “hate” Igbos. Firstly, Awolowo is not just a politician; he is also reputed to be a sage. In Yoruba mythology, warfare is considered sacred. Declaring war requires thoroughness, so one has to be sure of victory. No one declares war and goes back home defeated alive. This is a fact the sage knows for sure! Secondly, if anyone was expecting Awolowo to have gone ahead to declare “Oduduwa Republic” as it was popularly speculated, then their underestimation of Awo’s intelligence is obvious. There was no record of Awolowo or his supporters possessing war resources, considering the fact that he was just released from prison! Thirdly, it is on record that Awolowo worked with many Igbos throughout his political career. Awolowo appointed S.G. Ikoku as his party’s (Action Group) scribe in place of Ayo Rosiji in 1962; nominated Philip Umeadi as his Unity Party of Nigeria (UPN) running mate in 1979; M.C.K Ajuluchukwu served as UPN director of publicity in the Second Republic (1979-83) and so on. How better does one demonstrate his hatred for a tribe? Save for the controversies raised therein, it serves as: an interesting read for those who did not witness; a mind refresher for those who didn’t witness the pogroms but read other books on the topic; an extended resource for those who listened to oral version(s) of the war from those who witnessed it; a treasure for the lover of history who will be fascinated by the unique story-telling method employed in the expose and a good companion to lovers of Nigerian Civil War literature. A gargantuan and unusual expose of the most sensational aspects of Nigerian history- the Nigeria-Biafra War! 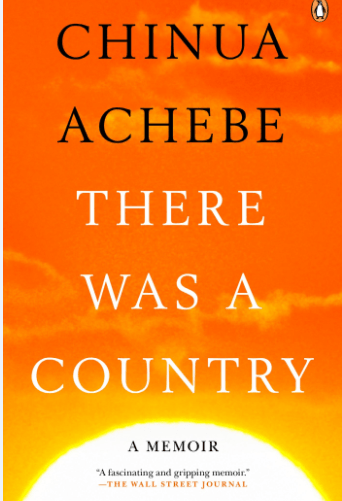 Achebe, C. There Was a Country (London: Penguin Press, 2012). Really, It’s Black Man’s Dilemma!